Basil Twist's production of Dogugaeshi. Photo credit: Richard Termine. The only reason I didn’t give Basil Twist’s hypnotic Dogugaeshi a standing ovation was that I was simply too stunned to rise from my seat. Certainly I was prepared to be enchanted, after my last experience of the Basil Twist Festival – Petrushka at Shakespeare Theatre Company – but this was even more intense. Over the course of one hour I’d been transported, body and mind, to a theatrical state I had never experienced before. There’s a haunting beauty to Dogugaeshi. As it’s a very brief run I urge you to catch it this week before closing on April 22. 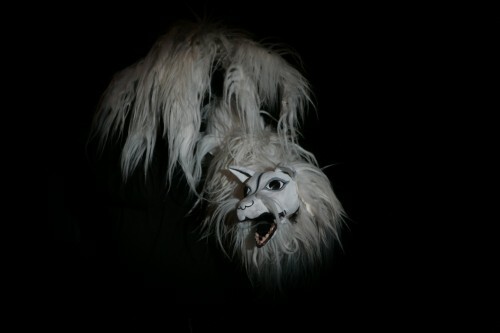 If it were just a presentation of Japanese folk puppet theater, that would still be reason to see it, but Twist takes this classic form and reframes it as a profound elegy on time and the ephemeral nature of beauty. It’s the dogugaeshi itself, a “set change” stage mechanism, that tricks the eye until the viewer is almost in a trance. Or is it that strange, playful fox blowing out a candle? A dogugaeshi refers to the set device that allows for a series of screens to be slid across stage from sections of wings offstage, creating various stage pictures ranging from simple movement to more complex depth perception tricks. Screens can open to reveal another set, and another and another, like a giant puzzle box. They can slide back and forth, pivot or tilt – allowing inanimate set pieces the ability to practically dance across stage. Twist incorporates other puppetry and light projection elements along with the set pieces in order to tell the story of both the rise and the fall of this folk art. The eerie incandescence of Ayumu “Poe” SAEGUSA’s lighting supervision, Peter Flaherty’s projection design and Greg Duffin’s sound design all combine to create moments of beauty that are simply indescribable. Against this background, two participants are freed from the screens’ confines – the mysterious fox, and shamisen player Yumiko Tanaka. Yumiko Tanaka in Basil Twist's production of Dogugaeshi. Photo credit: Richard Termine. The three stringed shamisen has a wistful power, and Tanaka plays perfectly, even while on a revolving turntable at times trading places with the fox puppet. It sounds ridiculous, but it works. Just as the eccentrically tilting screens should seem silly, but are in fact as heartbreakingly delicate as cherry blossoms in the wind. At the end of the performance, Twist invited the audience backstage to look at the dogugaeshi from a more utilitarian angle. It was shocking to see how small it really is, the screens packed tightly together, the depth actually quite shallow. Stage magic may be just trick of the eye, but the emotions we experience while watching are real. A gentleman behind me shouted, “Bravo!” after the fox whirled and danced through the air. Whether it was applause for the artistry of the puppeteer or the fox itself or both, the emotional reaction to pure theatrical genius is something to be treasured indeed. 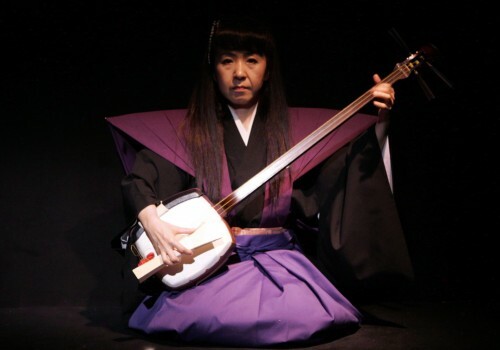 Dogugaeshi performs at the Studio Theatre now until April 22 as part of the Basil Twist Festival. Studio Theatre is located at 1501 14th Street NW, Washington, DC 20005. Closest Metro stop: McPherson Square (Orange/Blue lines), U Street/Cardozo (Yellow/Green lines). For more information call 202-332-3300.